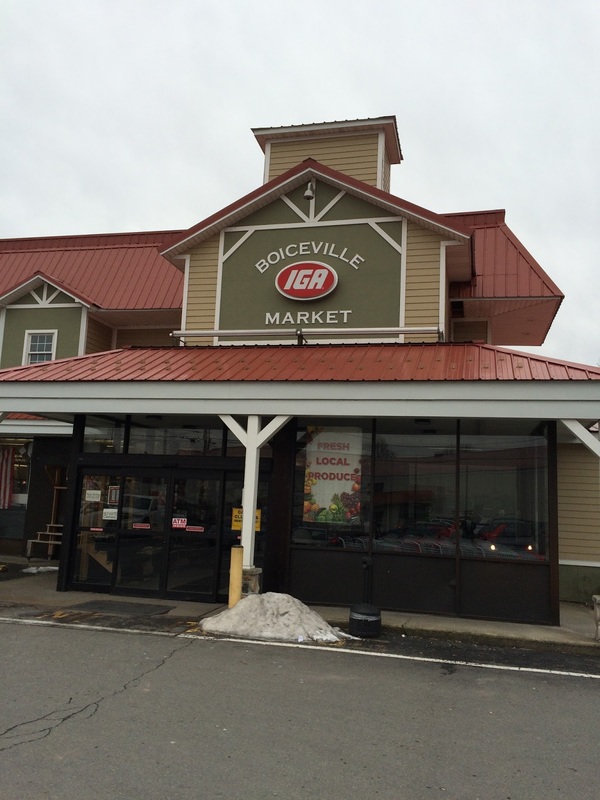 Welcome back to the Easton Food Market! Initially, I posted this store on Flickr after my visit in September of 2016, but I've now prepared it as a full tour. Going forward, I'm trying to get some of the pre-blog material on Flickr written up for the blog. So far, it's slow going. 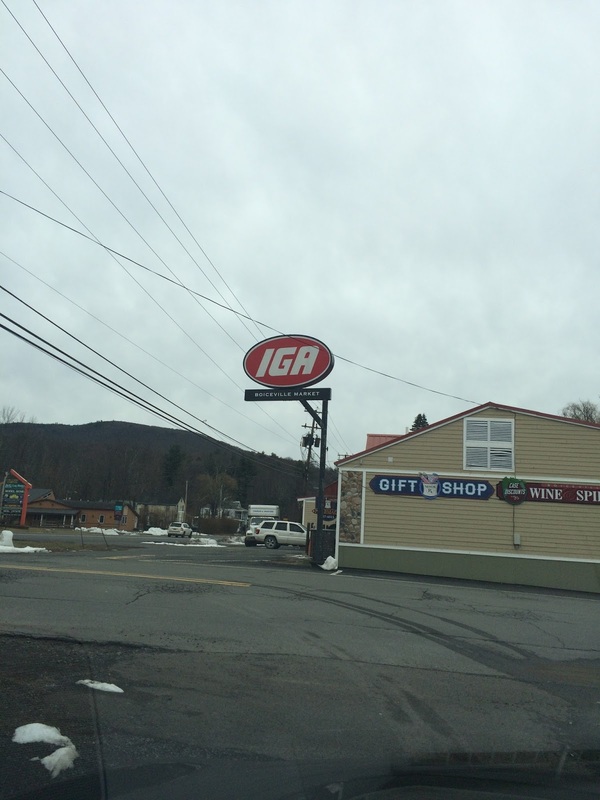 This supermarket is located way in the back of a residential neighborhood of Easton, and backs up to INT-78. According to Josh Austin, it opened as a Food Lane supermarket in 1962 but was later expanded into a Laneco department store. After this closed in 1997, TJ Bart's (a local chain) moved in, closing by about 2005. C-Town, owned by Juan Diaz, moved in soon thereafter, remaining in business until about 2012. Easton Food Market, a Pioneer supermarket, moved in (possibly even keeping the store open during the transition). The store itself is quite large, and commenters on Josh's Flickr page say that C-Town blocked off part of the sales floor, so it's possible EFM has reopened all of the sales floor space. Acting as a small supercenter for the lower-income neighborhood, this store offers everything from a cafeteria and HABA to a dollar-store section and U-Haul rental! You enter under the logo and turn right to the produce department, which runs along the front wall. The green wall is the front of the store. The produce department is very attractive and well-stocked. Looking along the front-end. The entrance is just past the end of the green wall section, with grocery aisles to the right. Meats are in the first aisle, with frozen foods in the second aisle. Deli is in the back corner on this side with dairy along the back wall, and hot food/bakery in the far back corner. The bright colors on the walls make the store feel very lively, and it helps that it's spotlessly clean. Packaged meats and butcher (closed in the early morning, when I visited) in the first aisle, with deli in the back corner. Dairy (yellow) runs along the back wall. Looking up the frozen aisle (second) towards the front of the store. Old cases, but in nice condition. Very yellow dairy along the back wall. Again, these refrigerator cases are very old, but well-maintained, like most of the store. The aisle markers are new and feature the (awful) apple-keystone-flowerpot(?) combination logo. Looking up the center aisle from the frozen foods side, with the front of the store to the left. Hot food, bakery, and a small seating area (behind the soda) in the back corner. This area is very spacious. I was not as brazen ahem, confident with my picture-taking as I am now, so I didn't go any closer. Large bulk foods section in front of the hot food-bakery area. The side wall is lined with home goods, toys, etc. A much larger selection than I had expected. Even greeting cards! Common in larger supermarkets, but not the small ethnic-type stores. Looking back towards yellow dairy. HABA and the customer service section along the front-end. And finally, looking from the service/HABA side of the front-end towards produce/meats. I think produce is the only department (other than hot food and frozen) that gets a sign. The others just get colors! I was very surprised and impressed with Easton Food Market, a very clean, well-stocked, and full-service supermarket. Plus, the staff went out of their way to be friendly. Definitely stop by if you're ever in the area! And if my tour isn't enough...the About Us page has a great set of photos that show the whole place very thoroughly. Special, today only: three Snapshots for the price of one! We're looking at three former supermarkets so close you could throw a Frisbee from one and hit either of the other two. The first building you see here was an ACME. The second (just past the two-story building) was an A&P. And the building with the tall clock tower is on the site of a ShopRite! The former ACME (45 S Livingston Ave) is now the Firehouse Commons, a small strip mall which includes a Walgreens and faces away from Livingston Ave, the main road visible here. There is a large parking lot in the rear. We've seen these pictures before. This was more recently a Bottle King, which moved to the Livingston Circle. I'm not sure if this is the original building. It remains vacant. The blue metal frames along the top, however, have been painted. It would be the perfect space for a small gourmet or produce market. And finally, on to the former ShopRite (now 6230 Town Center Way). The brick complex on the far side of the intersection is the Livingston Town Center, a development built ca. 2007 that includes retail and residential units. Its high rent, however, has been a constant problem in commercial tenant retention. 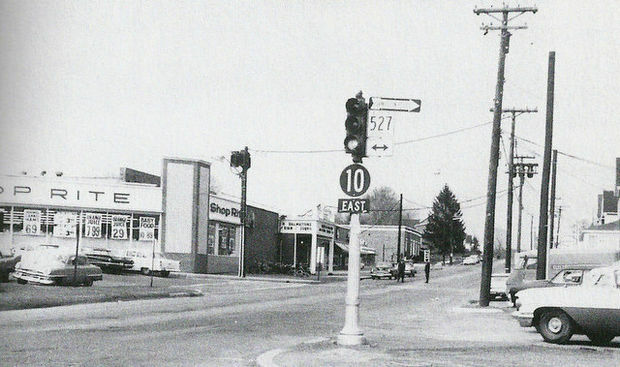 The ShopRite was on the right side of this corner, with a movie theater on the left side. The building is long gone, but here's what the ShopRite looked like. Hard to tell if any of those buildings are the original ones that held the supermarkets, but it's definitely where they are located! Welcome to the downtown of the small Rockland County town Piermont, NY. It's basically a single-street downtown that has multiple restaurants and upscale shops. It's also home to this former supermarket, which closed ca. 2014. It remains closed today, despite posters in the windows advertising Market Social, a gourmet takeout restaurant/greengrocer run by a restaurant family. 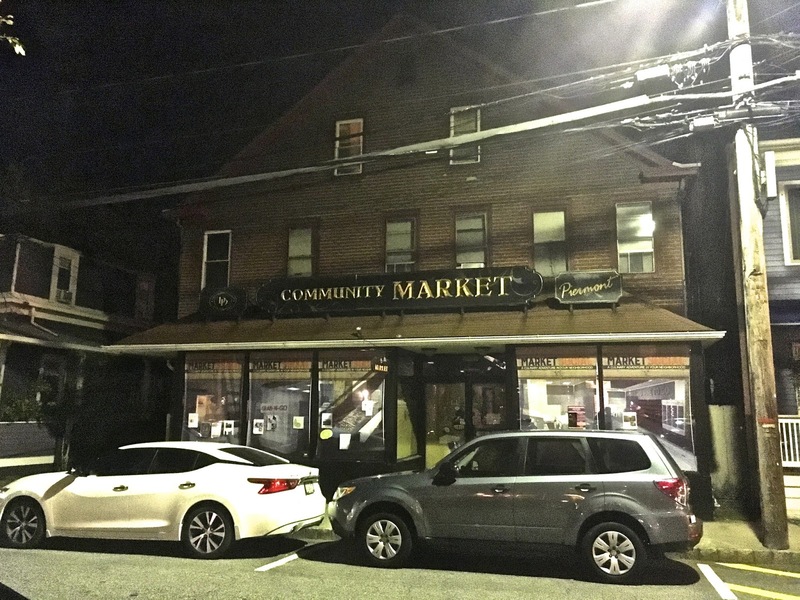 The owner of Community Market also owned a restaurant that didn't make it in town either. Market Social's opening has been pushed back several times, and it remains to be seen whether it will actually happen. The store is located at 487 Piermont Ave, Piermont, NY.